Seventy years ago today, what many consider the last cavalry charge in history took place in the Soviet Union. The era of large-scale clashes between mounted fighters, which stretched back to ancient times, had finally come to an end. With sabers drawn, about 600 Italian cavalrymen yelled out their traditional battle cry of “Savoia!” and galloped headlong toward 2, 000 Soviet foot soldiers armed with machine guns and mortars. On August 23, 1942 (some sources say August 24), the cavalrymen—part of the Axis invasion of the Soviet Union during World War II— were attempting to close a gap that had opened up between the Italian and German armies along the Don River. It was to be the end of an era. Though experts believe that smaller and less well-documented cavalry charges likely occurred later on in World War II and possibly as late as the 1970s in Rhodesia (now Zimbabwe), they generally describe this as the last major charge in history. In a closely packed formation, the Italian cavalrymen hurled themselves at the left flank and rear of the Soviet line, tossing hand grenades and slashing with their sabers. Despite heavy losses, they then passed through the line in a reverse direction and helped to dislodge the Soviets from their position. Other World War II cavalry charges had not been so lucky. 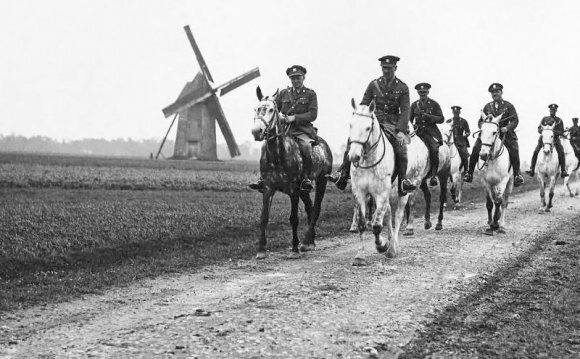 At the beginning of the conflict, Polish lancers purportedly attacked a German infantry battalion (but not tanks, as Nazi propaganda would have us believe) and suffered predictably disastrous results. The final U.S. charge took place in the Philippines in January 1942, when the pistol-wielding horsemen of the 26th Cavalry Regiment temporarily scattered the Japanese. Soon after, however, the starving U.S. and Filipino soldiers were forced to eat their own horses. Two months later, Japanese troops in Burma almost completely wiped out a charging Indian regiment under British command. A cavalry charge during the 1813 Battle of Leipzig. Napoleon Bonaparte, who built up a potent cavalry force of his own, typically weakened the enemy lines with artillery fire and then sent in his cuirassiers for the decisive blow. “The French cavalry under Napoleon were known to be the finest in the world, ” particularly in the way they handled large formations, said Jeffrey T. Fowler, an associate professor at the American Military University. “They were very well trained to the point where they could stop, they were maneuverable, they could change direction, they could do all of these things.” Nonetheless, even they suffered a disastrous defeat at Waterloo in 1815. Headhunter is the first novel, published in 1984, of the Special X series by Michael Slade. Point de Maisonnette is a cape located in northeastern New Brunswick, Canada. Its geographic coordinates are 47º50'15"N, 65º00'13"W.